The Power Saver Industrial (PSI) boosts the efficiency of the heat exchange and air-cooling processes in industrial air conditioning systems. The device generates a PVA Field to significantly improve the efficiency of refrigerant compression and heat transfer by aligning the protons in the condenser and evaporator, thus effectively achieve up to 10 – 30% saving on operating costs. The augmented result can be further achieved when used in combination with an IPC’s Protonic Booster (PB). Both PSI and PB are energy saving devices under family of Protonic Power Savers. The Protonic Power Savers can be applied for any refrigeration system in a wide variety of places, including offices, cold storages, cooling containers and cooling trucks. They can also be used in hotels, conference centres, convention centres, warehouses and many more. The Protonic Power Savers can save your money from operation cost due to the AC system now runs much more efficiently with shorter cooling time. It could save 10 - 30% energy and perform stably throughout the operational period. The Protonic Power Savers help improve compression efficiency due to the alignment of refrigerant and electrons particle vibration. They also improve heat transfer in compressor and evaporator so that the AC system could operate more smoothly and quietly. Energy saving solutions provided by the Protonic Power Savers can give your noticeable improvement in energy efficiency yet protecting our nature; it makes the devices a more sensible choice in terms of reducing carbon emission and bringing us a greener living environment. Both PSI and PB can be easily installed and relocated anytime. No modification is required on the existing AC system. It offers an extended flexibility to suit different needs as you expand the system. The modern design of PSI with carbon fiber casing in 3 different power models to suit various scale of the industrial AC systems. Completely safe and reliable. The Protonic Power Savers do not contain any materials that are radioactive, toxic or corrosive. 11" x 2.5" x 0.3"
Product safety Does not contain any materials that are radioactive, toxic or corrosive. 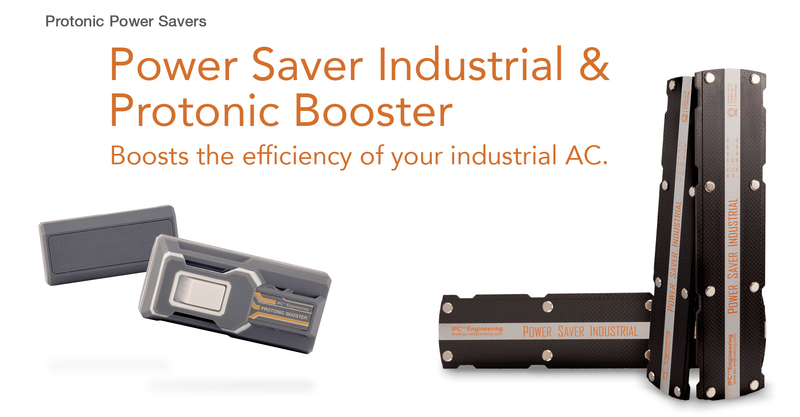 The Protonic Power Savers are enabled by Pico Technology.